Download this report to learn how to gauge competing flash storage products and vendors that align with your company’s modernization objectives. 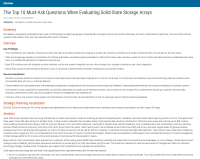 Move over, hard-disk drives, because Solid-State Storage Arrays (SSAs) are threatening the long-standing primary data method by being more scalable and using less power than hard-drives. SSAs are now more suitable for business-critical usage and within the reach of your enterprise budget. Flash success demands that critical questions be asked when choosing the right solution to simplify your purchase cycle, lower costs and reduce the risk of technology acquisition. Now Gartner is shortlisting candidates using their critical capabilities documentation to help speed up the selection process for your organization.